My friend Willy captured this early instar (Instar: Many invertebrates molt through dozens of progressively larger and better-developed stages as they grow. Each of these stages is known as an instar. Hard-bodied nymphs typically molt through more instars than soft-bodied larvae.) damselfly nymph and brought it to me for identification. It is more robust and stocky at this early stage than the spindly appearance of the later instars (Instar: Many invertebrates molt through dozens of progressively larger and better-developed stages as they grow. Each of these stages is known as an instar. Hard-bodied nymphs typically molt through more instars than soft-bodied larvae. ), and its appearance is less familiar. 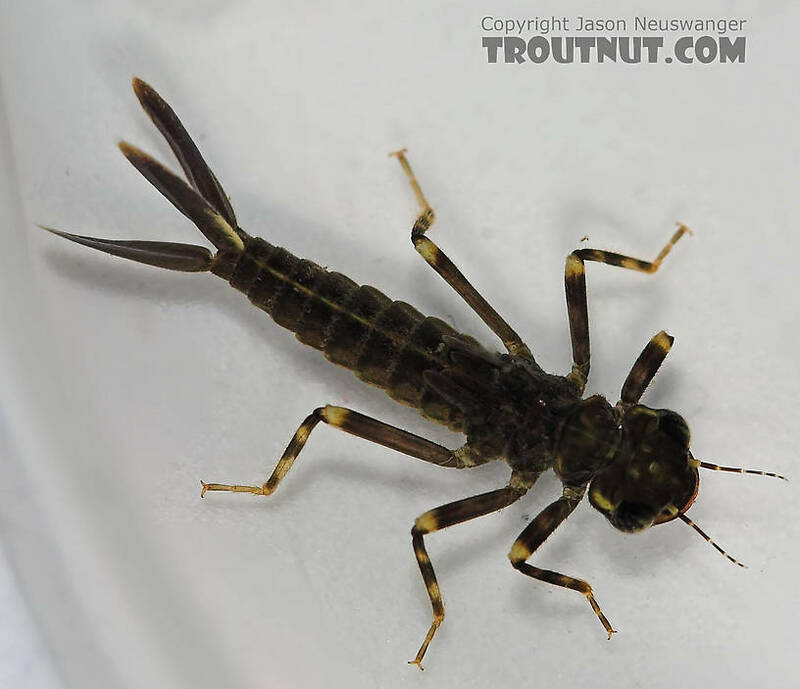 This damselfly was collected from Fall Creek on August 28th, 2005 and added to Troutnut.com on April 14th, 2006. 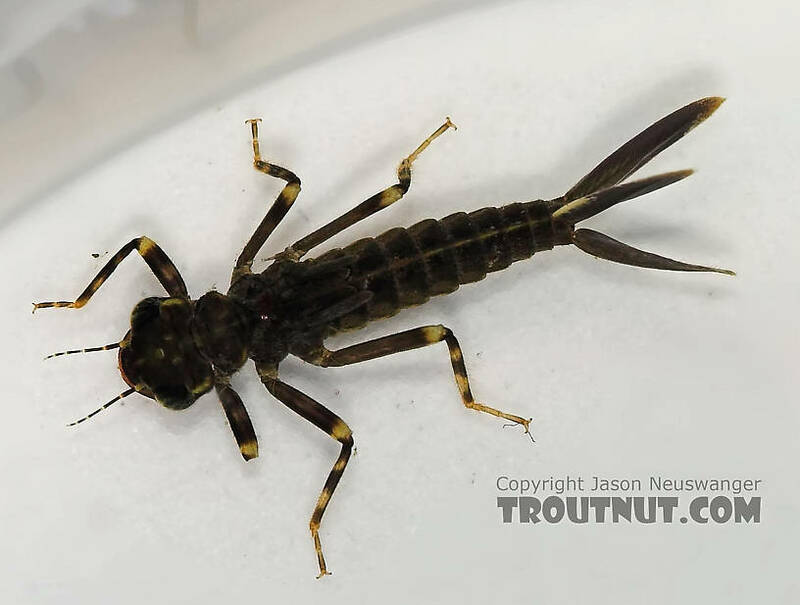 Whenever I go up to the Adirondacks in midsummer to fish, I always observe alot of damselflies aroundand know the trout take them, at least occasionally, because I've watched them do it. I was wondering what size the nymphs were and if a black stone fly pattern of correct size might imitate the nymph well enough. The trout in Wisconsin on July 3, 2008 were eating the fly's as they emerged. Gosh they make a ruckus as they took to the air. They only emerged under a very low bridge, not upstream or downstream from the bridge. I've never witnessed this before. One reason I think it's Argia, is that this genus is characteristically "stubby" and "robust" through the last instar. Without verification, I think it is the stubbiest of the Zygoptera. 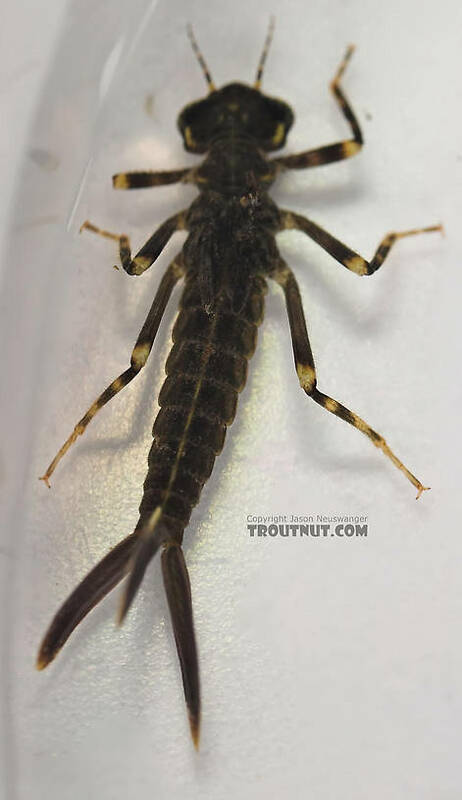 May be Argia, detailed pictures of the prementum are always good for the ID of Odonata. Odonata can be tricky in general though, so the more details the better.